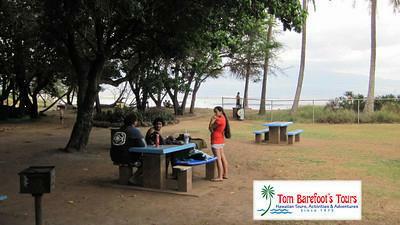 Haycraft Beach Park is a very small Maui County park located at the very eastern extremity of the town of Maalaea. Being almost adjacent to Maalaea Harbor you will be able to see the boats coming in and out of the harbor on their daily routine. From Haycraft Beach you can walk east on one of the longest beaches on the island eventually taking you all the way to Sugar Beach in North Kihei. This is a walk frequented by many visitors on a daily basis during their visit to Maui. In the winter months you can see volumes of whales on this daily trek thus providing both exercise (it over a two mile walk each way) and interesting scenery. Haycraft Beach is the closest swimming location to the condos that line the Maalea shoreline and as such is a popular respite from the summer heat. Many of the condos have a similar view from their lanai but only have a rock promontory abutting their units. Surfing and boogie boarding are big activities at Haycraft Beach when the south swells roll in during the summer seasons. 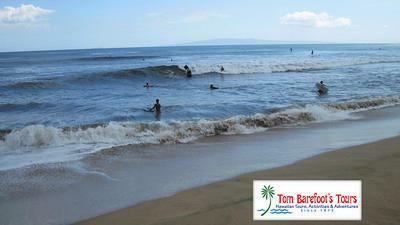 As the locals say, these waves are "plenty good fun" and they are generally suitable to various skill levels. It's nice that after a day in the ocean the park has a shower where you can wash off prior to jumping in your car and heading back to your hotel or condo. The breaks closer to the shore are better for intermediate surfers, the break on the far outside that is called "Freight Trains" only comes alive on a big south swell and is for advanced surfers only. When the wave is breaking it is not uncommon to spot surfers from other islands that have jumped on a flight just to get the opportunity to ride a wave here. If you ever get the opportunity to see it, you will know why. The wave is one of the fastest right hand barrels on the planet, and the surfers here get some incredible rides. On the right swell it is not uncommon to see surfers get barrel rides where they will completely disappear for upwards of five seconds before coming out again. It is an incredible thing to witness. 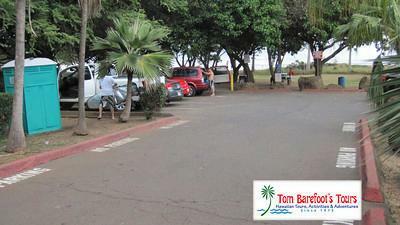 As far as amenities go at Haycraft Beach Park, there is a paved parking lot with additional parking on Hau'oli Street. There are a couple of picnic tables and barbecue stations. A shower is available as are portable toilets. No lifeguards are on duty here. Please be advised that all beaches and ocean locations in Hawaii can be potentially dangerous including this location of Haycraft Beach. Be completely aware of the ocean conditions prior to entering the water and of course, never turn your back on the ocean when you are on the shoreline. It should also be noted that all shorelines and beaches in Hawaii, including Haycraft, can be frequented by sharks, jellyfish and other sea creatures which can provide potential harm to people entering the water.